Again this is very loose…there are a lot of places along the path that we’re planning on visiting. So this list is nowhere near exhaustive or complete. Late June – Leave Fort Worth and head toward Santa Fe. That is quite the list. And we understand that we won’t get to spend a lot of time in some of these places. 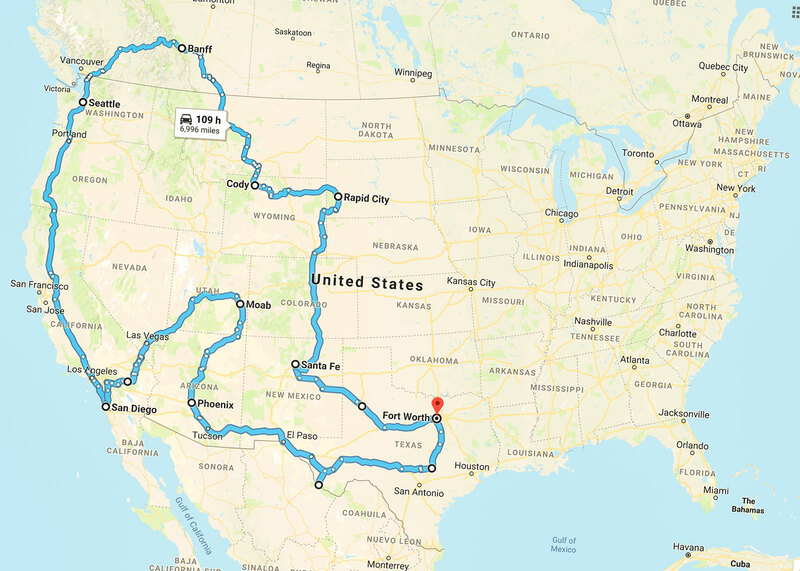 For example right at the start, we’re rolling through Santa Fe and Denver, before sitting for a bit in Rapid City and Yellowstone. There are many places we’ll only stay a couple of days…and others we’ll spend a couple of weeks. And again….it’s fluid. We may not hit all these places. We may divert and go a different way, or we might decide to stay longer and run out of time and have to cut the end short. But part of the fun is in the adventure, and going off the list above, it’ll certainly be one. So what do you think? Are we still crazy? Do you have any recommendations along our path for sights we can’t miss or food we have to try? Let us know on our Instagram! And if you haven’t followed, we’d love it if you did! !